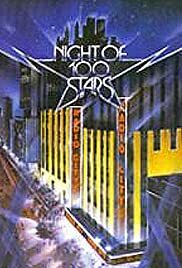 There were three "Night of 100 Stars"
I still have all three tapes. The first in 1982, was the best. Actually 200 Stars appeared, each one was numbered on the screen at the time on stage. Best scenes, as they lit each candle on the birthday cake, a star would appear and tell all that happened during each decade. Lisa Minelli singing 'New York, New York' joined by 8 members of the N.Y. Yankees. James Cagney made his appearance in a wheelchair, and broke down crying. The clothes fashion number and organ music was terrific. The show closed with the remaining male stars escorted by a rockette on stage to the music "One." The finale showed all 200 star standing together singing "Until the parade passes by."